Great news, everyone! Fortnite now has Orb. 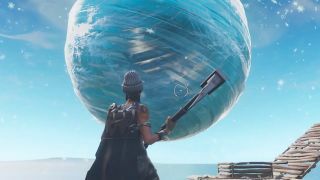 An icy sphere levitating above Polar Peak appeared when update 7.20 went live earlier today, and it already has players (like J05H_Tries, who captured the source of the screenshot above) speculating about what it may mean. They're especially curious after the majesty and splendor that was Kevin the big purple cube. RIP, F, gone but not forgotten. Unlike Kevin, Orb doesn't punish you for attacking it. It just hangs in the air, unmoved by your petty human aggression. Get close enough, and you can see that Orb seems to be a translucent ball of blue ice surrounded by whirling snowflakes. Your screen turns white with frost if you invade Orb's personal space, but take a few steps back and everything goes back to normal. You can even jump on top of it, though you'll quickly slide off (ice, innit). It could be that Orb will steadily descend from its low geosynchronous orbit over Polar Peak, melting as it goes, and reveal whatever that shining bauble of power the Ice King is holding. He's always looked a bit sinister, what with the spiky crown and angry glowing eyes, but he's gone full villain this time. Or maybe Orb will float lazily over to Tilted Towers and drop straight through the building that finally finished construction as of this update because we can't have nice things. We'll keep a close eye on our pal Orb and keep you informed about any icy movements. Though not so close that our screens get all frosty. Learn more about the other big change in this update: Fortnite glider re-deploys coming back in item form!